No, this is not a new book. But it’s a book worth buying, as I still turn to it time and time again, even now that I’m plant-based and gluten-free. Years ago I house-sat for a slightly crazy rich lady, who had an incredible kitchen and a hoarder’s fridge. This was one of her cookbooks, and I made a few dishes from it then. Then I went home and forgot about it, since the book was out of print. Years later I’m in Crate and Barrel and lo and behold, there it is! 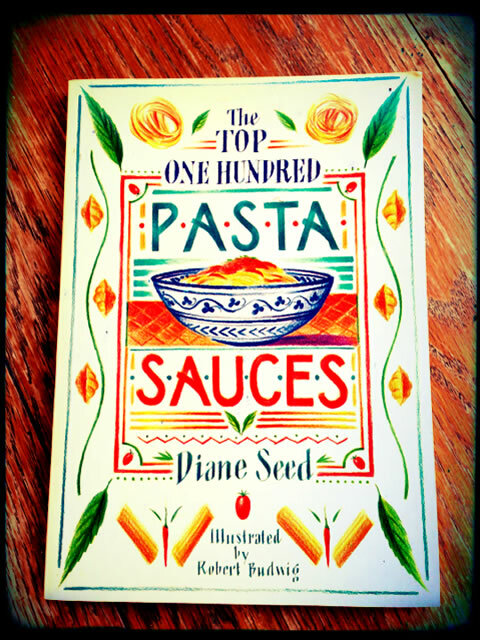 I was so excited to buy a copy and revisit some of those great recipes. 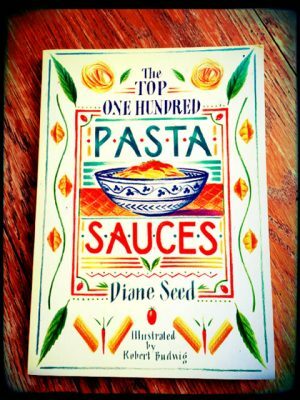 Since you can still buy it, here’s my review of The Top One Hundred Pasta Sauces by Diane Seed. I love the charming, colorful illustrations by Robert Budwig. It makes the entire book feel special, like a party on every page. It reminds me of how beautiful cookbooks can be without photographs. 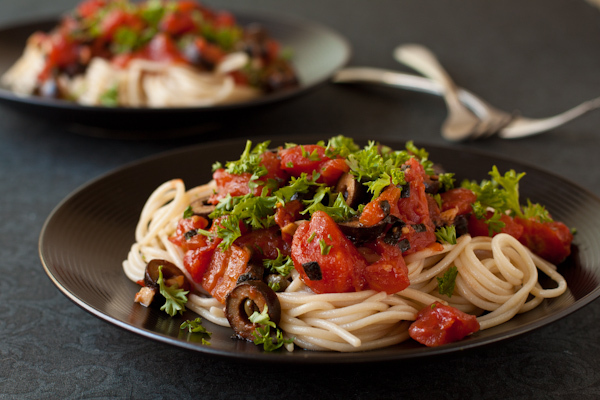 I like the thorough explanation of pasta, the history of the recipes, that all recipes are provided in Imperial (i.e. U.S.) and metric measurements, and the incredible variety of recipes. It’s also great how she organized it, as the sauces are listed by key ingredient, with the largest section being vegetables. While I am now gluten-free and plant based, I can still use most of the book. She does include fish and shellfish, cheese, meat, and special-occasion dishes towards the end. Besides spaghetti alla puttanesca, I have made spaghetti indiavolati (deviled spaghett—spicy hot! ), penne all arrabbiata (pasta quills with fiery sauce), spaghetti with tomato and orange sauce, tagliatelle with tuna, and probably a few more over the years. All delicious. Well, really, no complaints. It’s not a gluten-free cookbook, obviously, so I have to make adjustments. And I don’t add the cheese she suggests unless I have a good vegan alternative. Sounds like a great book – Hope you’re having a great day! I had to laugh when I read about the (slightly crazy rich lady). Hey, that could be me! Except for the rich part, I have always hoarded food, my fridge is always pack and I have two full size, my pantries are totally over loaded, I have canning jars full in the basement shelves. And the funny part is my family comes to my house to grocery shop (of course free of charge, what’s up with that? ).